Complete dentures are called conventional or immediate according to when they are made and when they are inserted into the mouth. 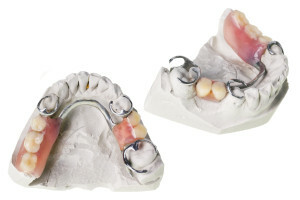 Immediate dentures are inserted immediately after the removal of the remaining teeth. To make this possible, the dentist takes measurements and makes the models of the patient’s jaws during a preliminary visit. The initial diagnosis is made. A try-in is placed to assure proper color, shape and fit. The patient’s final denture is placed, following any minor adjustments. The dental laboratory makes a mold or model of your jaw, places the teeth in a wax base, and carves the wax to the exact form wanted in the finished denture. Usually a wax try-in of the denture will be done at the dentist’s office so any adjustments can be done before the denture is completed. The denture is completed at the dental laboratory using the lost wax technique. A mold of the wax-up denture is made, the wax is removed and the remaining space is filled with pink plastic in dough form. The mold is then heated to harden the plastic. The denture is then polished and ready for wear. Pronouncing certain words may require practice. Reading out loud and repeating troublesome words will help. If your dentures click while you’re talking, speak more slowly. You may find that your dentures occasionally slip when you laugh, cough or smile. Reposition the dentures by gently biting down and swallowing. If a speaking problem persists, consult your dentist.